9 parts, also available Kit Number 5154, Bare Chest Version. This figure indicates the wide variety of dress adopted by the gun crews on Victory. They universally had bare feet, one to avoid slipping on a wet deck and two to avoid any possibility of a spark with the inevitable spillage of powder grains. 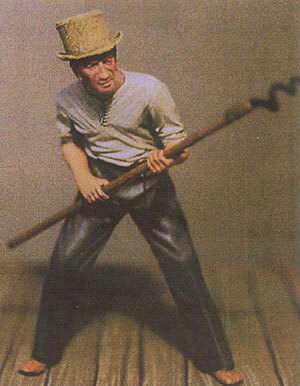 This model shows a crewman equipped with a worm, designed to allow the extraction of wads or other obstruction left in the gun barrel. The superiority of British naval gunnery was maintained by trained members of the gun team dealing with any eventuality that might interfere with the continuous firing of the gun.